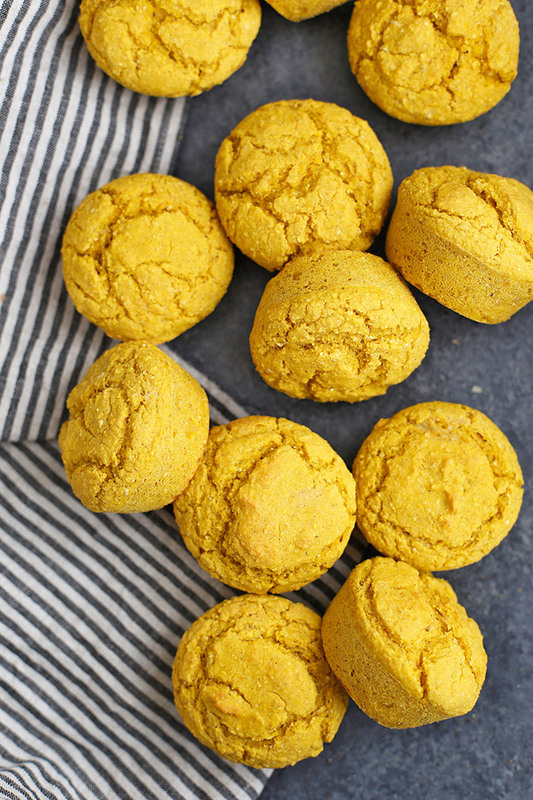 Gluten Free Pumpkin Cornbread Muffins – These light, fluffy pumpkin cornbread muffins are an all-time favorite. The perfect cozy accompaniment to chilis, soups, salads, and more! Hi. I’m Emily, and I’m sort of in love with cornbread. We’ve made so many versions over the years I can’t count them, but I’ve been nailing down all the right proportions for these gluten free pumpkin cornbread muffins for the last several months and we’ve nailed it. The texture is light, fluffy, and satisfying. The flavor is delicate and cozy. They make your house smell amazing. Are you making them yet? 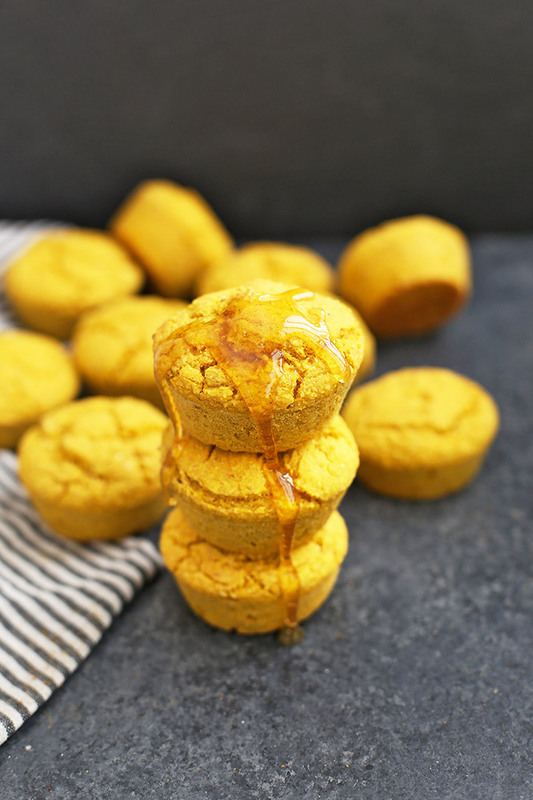 Though we love cake-like cornbread, and these gluten free cornbread mini muffins, these pumpkin cornbread muffins might just have them all beat. The pumpkin does wonders for the texture, and it’s amazing how flavorful and fluffy they get with almost no added fat! And don’t be fooled! 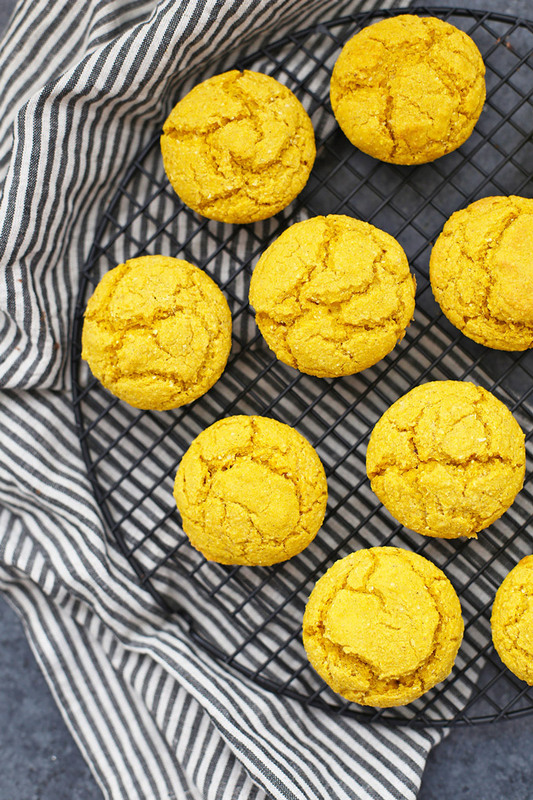 Just because they’re made with pumpkin doesn’t mean they’re only good in the fall. We make these all year round. They don’t taste especially pumpkin-y (they’re not stuffed with pumpkin pie spice, for instance), and they’re the perfect accompaniment to soups, chilis, and salads. The pumpkin gives them an amazing texture and color, and a lovely subtle flavor I crave regularly. 2. Not Gluten Free? No Problem! If you’re not gluten free, you can use regular white flour. I adapted this from an Ambitious Kitchen recipe and she uses whole wheat pastry flour. 3. How Do I Store These? You can keep them in a zip-top bag or airtight container on the counter for 1-2 days. If you’d like to keep them 3-4 days, you can store them in the refrigerator. They also freeze beautifully. I freeze them in a single layer and they’ll keep 1-2 months in an airtight container or freezer bag. To reheat, you can thaw on the counter/in the fridge or pop them in a warm oven for 10-15 minutes. 4. Substitutions and Changes. My favorite gluten free baking mix is this one. It’s a direct 1-to-1 substitute for white flour and gives me really consisted results when converting recipes like this. I don’t recommend using a straight flour (like all rice flour) since the results have been so varied when I’ve tried that. You can totally use dairy (milk and butter) for this if you’re not dairy free. You can also swap honey in for the syrup if you prefer. I’ve tried both several times and for some reason, I prefer the flavor and texture of syrup (which surprised me, since I love honey and cornbread together!). In a large bowl combine the cornmeal, flour, baking powder, cinnamon and salt. Whisk to combine. Whisk in the pumpkin, milk, eggs, syrup, and oil. Stir until just combined and no dry clumps remain. Scoop batter into a standard 12-cup muffin pan (spray or grease if not nonstick). Bake 17-20 minutes, or until cooked through (a toothpick will come out clean when inserted in the center of a muffin) and slightly golden. Allow to cool slightly, then serve warm! These muffins look amazing! I so can’t wait until we have our own kitchen soon! My father in law is GF and he said he hasn’t had cornbread in years. I can’t wait to try these for him! Thank you so much! I just LOVE them! delicious. used cup4cup gf flour. buttermilk(oldshool). I love cornbread. I had 1 cup of pumpkin already measured so I used it all. Perfectly moist. Thank you!! I’ll have another. Margie – I’m SO glad you enjoyed them! They are our favorite kind of cornbread. We’re making a double batch tonight! Brought these to Thanksgiving. 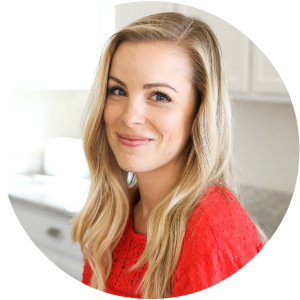 Emily, I received compliments from gluten-free eaters and those without dietary restrictions alike! Thanks for the great recipe. Oh, I’m SO, SO happy to hear that!!!! Hooray! I replaced the honey/maple syrup with 1/4th cup sugarfree simple syrup by using 1 tbs baking stevia and 3 tbs truvia brown sugar so there’s only 12 grams of added sugar vs. the near 64 from the honey/maple syrup. I also removed the salt and baking powder because I was using Pamela’s almond meal baking mix which has a primary ingredients of almond meal flour. I also added pumpkin spice (1 tsp) and used 2 tbs of unsalted butter. It came out FANTASTIC even with all of my alterations. So something about the ratio is really fool proof. Thank you for experimenting so much to come up with a good corn meal to flour substitute ratio! To clarify, the baking mix already has baking powder, xanthan gum and sea salt in it. So too much would have been bad juju (and possibly a weird irish soda bread! lol). Wow! Yours sound like a great solution! Thanks for sharing!